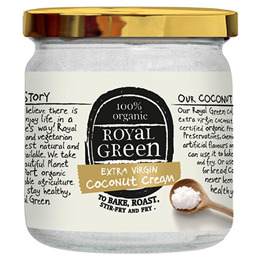 Royal Green Extra Virgin Coconut Cooking Cream is 100% certified organic. It is free of trans-fats, preservatives, chemical solvents, artificial flavours and colours. The cold press process results in a silky smooth taste and delicate coconut flavour and aroma. The cream is ideal for baking, roasting, stir-frying and frying and is rich in lauric acid and good for cholesterol. You can also take it raw and savour its delicious taste right off the spoon or in smoothies and your favourite desserts. In fact the cream is so full of goodness it can also be used as a certified organic deodorant or skin moisturiser and softener! Royal Green Coconut Oil can be used to bake, roast, wok and fry as a substitute for other cooking oils and can also be used as a substitute for butter on bread. Use the same amount as you would with any other oil. Below are reviews of Royal Green Extra Virgin Coconut Cream - 325ml by bodykind customers. If you have tried this product we'd love to hear what you think so please leave a review. 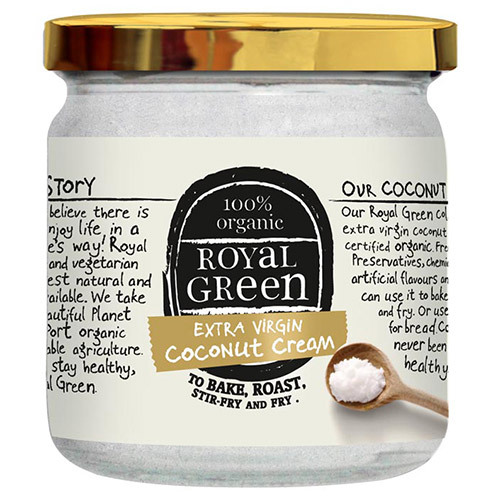 Royal Green Extra Virgin Coconut Cooking Cream is 100% certified organic. It is free of trans-fats, preservatives, chemical solvents, artificial flavours and colours.